Epping Ongar Railway is celebrating the 150th anniversary of the London Underground with steam events starting today and running over eight days until 1 July. 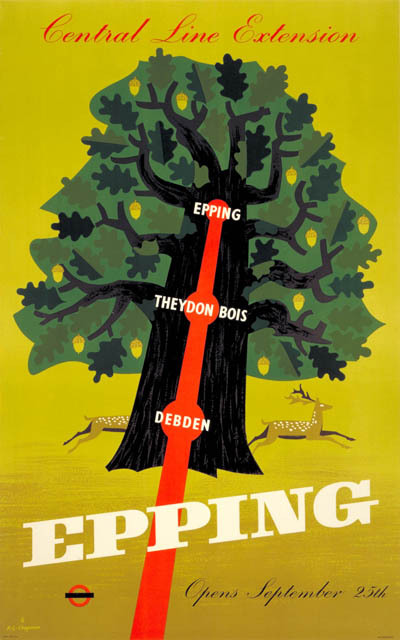 So today’s poster of the week was designed by K G Chapman in 1949 and is titled Epping – Central line extension. Epping had long been a popular out-of-town excursion, with Londoners flocking to enjoy the forest by bus and tram. The extension of the electrified Central line services, delayed by the Second World War, offered Londoners easier access to the forest in their leisure time. The beauty of Epping Forest has been celebrated in over 70 public transport poster designs, which are now stored in London Transport Museum’s Collection. London’s transport posters were produced to increase passenger numbers on off-peak services. The brightly coloured graphics would have appealed to weekly commuters and encouraged them to travel at weekends and in the evenings. Epping Forest was a popular destination for Londoners to escape the city and one of many destinations promoted in this way. George Chapman attended Gravesend Art School from 1924 to 1928 where he studied commercial design. In the 1930s he worked for Shell. He attended the Slade School of Art and later, towards the end of the 1930s, the Royal School of Art. Chapman was a printer and printmaker but also designed packaging, including work for Price’s Candles in 1936. He was a member of the Society of Industrial Artists and examples of his work are held by the V&A, Whitworth Art Gallery and the Glynn Vivian Art Gallery. The initial section of the Central line opened to the public as the Central London Railway (CLR) on 30 July 1900. It ran between Bank and Shepherd’s Bush and had a flat fare of 2d (the equivalent of £0.87 pence today) and was an immediate success. Two short extensions were opened – west to Wood Lane on 14 May 1908, and east to Liverpool Street on 28 July 1912. Epping and Hainault were opened in stages between 1946 and 1948 and were finally electrified in 1956 but eventually closed in 1994. The Epping Ongar Railway is London’s only heritage steam railway. It also has a rather quirky distinction of having buffer stops at Ongar form the datum / 0.0km point from which all distances for the whole London Underground network are still measured.